Are you thinking of where to hangout with friends over some pints of CONNOR’S Stout Porter? Well we have a few suggestions and recently we hopped over to Ceylon Hill after office hour to chill out and also tried the new CONNOR’S Infused Dishes at Hubba Hubba Ceylon. I am missing their Asian Spicy CONNOR’S Lamb Pizza and what if I told you I had CONNOR’S Infused fish and chips. It’s time to unwind and catch-up with some friends over good food and drinks at this grungy campus style and harmoniously mismatched interior of a party hub. I love relax and casual ambience with high ceiling plus the breezy vibe fueled by quirky quotes on the walls that looks like container. I had a pint of CONNOR’S Stout Porter and chatted with friends while waiting for the food to be served. Sipping my pint of CONNOR’S Stout Porter of gentle roasty aroma with smooth and crisp texture, creamy head and dense foam relaxed me after a long day at work. I don’t mind going back for this Asian Spicy CONNOR’S Lamb Pizza because it paired so well with CONNOR’S Stout Porter. This is not any ordinary pizza, its tomato thin crust spread with a CONNOR’S infused curry paste with generous amount of mozzarella and cheddar cheese sprinkled on the crust followed by a lamb varuval topping. Then topped with curry leaves to enhance the aroma of the lamb varuval, chopped fried dried chilli and red onion are strewn on top. It is a perfect finger food for spicy food lovers anytime of the day. When they served the pizza the aroma makes me salivate. The flavourful of the whole ingredients combination of this pizza ~ lamb varuval with CONNOR’S infused curry paste, the curry leaves, chilli and also the generous amount of quality mozzarella and cheddar cheese. According to the Chef at Hubba Hubba, the curry paste is a blend of many different spices then infused with CONNOR’S to give the depth of piquancy to the dish. I can taste the hint of CONNOR’S when I bit into the lamb mixed with curry paste. The spiciness makes me thirst for more CONNOR’S Stout Porter. This is a satisfying dish and one of the best finger food to be shared or for single. Wow this is my first time trying fish infused with CONNOR’S usually is red meat or chicken but this round is a twist. If you never try, you’ll never know. British Brew CONNOR’S Battered Fish & Chips is kurau fish fillets covered with CONNOR’S-infused batter are deep-fried to golden perfection and comes with a petite salad and home-made hand cut fries. The crispy CONNOR’S-infused batter is unique and it gives a rich earthy aroma to the Fish & Chips. First squeeze the lemon on the Fish & Chips to add some zest and balances the richness taste of the fish. Cut the fish into smaller pieces and dipped in the sauce and enjoy. Then take a sip of your CONNOR’S Stout Porter... ahhh. Overall the CONNOR’S Infused Dishes @ Hubba Hubba are satisfying. For spicy food and lamb lovers you will like the Asian Spicy CONNOR’S Lamb Pizza. And for those who is curious about how fish dish infused with CONNOR’S do give it a try, the batter is something unique. CONNOR’S imparts richness to each of the dishes and adds intensity to the flavours. It was a fulfilling CONNOR’s Experience with so many things to share and talk about that night plus the good food and pints of CONNOR’S Stout Porter. 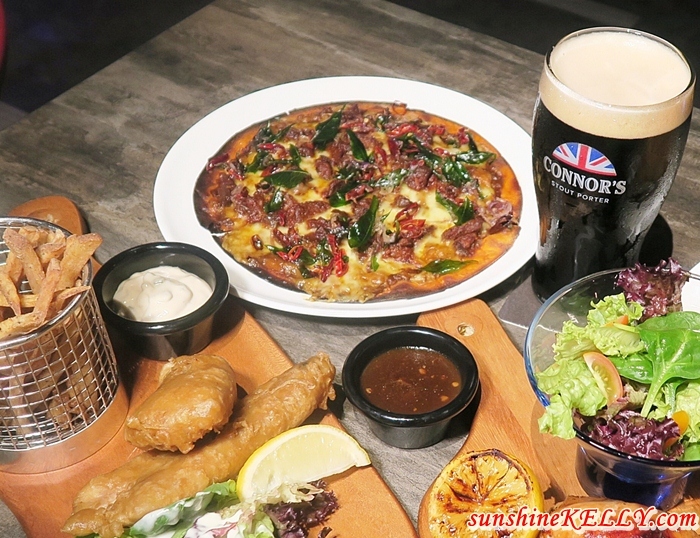 By the way, CONNOR’s Experience is all about fully enjoy ourselves with friends; from the delectable CONNOR’S-infused dishes paired perfectly with a pint of CONNOR’S Stout Porter at great prices to getting home safely after a fun night out. It’s A Night Made Right with our buddies all packaged in one amazing deal. Be sure to experience it. 1, Lorong Ceylon, 50200 Kuala Lumpur, Malaysia. via Budget Taxi or GrabCar to the CONNOR’S Experience participating outlets. So might as well use GRAB then drive, it is safer plus don’t drink and drive. CONNOR’S Stout Porter also embrace “Drink Responsibly” mantra through partnership with Grab; whereby you can enjoy free ride to and from each participating outlet. Use the promo code GRABCONNORS to enjoy the exclusive discount of RM8 off for 4 rides to the participating outlets for customers that pay via credit/debit card only. If you ride with GRAB to the participating outlets, you are also entitled for a FREE Half Pint of CONNOR’S Stout Porter. All you need is to flash your booking receipt to enjoy this reward. Each booking receipt is entitled for 1 FREE Half Pint of CONNOR’S Stout Porter. Enjoy bah! The ambience looks amazing. I won't touch the drink but I'd absolutely take the food! Seperti kata Ellen De Generes, Hubba Hubba! The cheesy nampak sedap sangat! omg! !the cheese pizza looks so nice and yummy!!! nice food and beer! definitely worth going! The pizza and fish & chips look great! Will definitely order that if I come here! A perfect pairing between Connors and the western food like pizza. The smooth Connors kill the thirst in my throat. I am not a fan of the drink. But that pizza really looks delicious. I would order that pizza, but probably with plain rootbeer. Connors Pizza goes well with stout porter. They both look so tasty. The food is awesome with beer of course! The interior too is very enticing to dine inside. The pizza makes me feel hungry now, I liked it. The food looks pretty amazing with all that melted cheese! Yummy! Looks like a perfectly cool hangout place. That image of a monkey saying dinner is poured is definitely quirky! I'm a great fan of pizza and with this pizza that is really new to me, I wonder how it really tastes like, but I guess it's really delectable as what you have said. I would love to try it when I get the opportunity. Lovely place to hang out with friends and pizza looks yummy and spicy though I am not a fan of drink. Tempting!! Spicy pizza is always very inviting. Drink lovers will get to enjoy more with Connors.